I'm taking a field trip to Fort Worth with my family to meet Good Karma Kitchen, a vegetarian/vegan, and gluten-free food truck here...in Texas. Sounds very...fictional. I think we have to wait for a black president or a Chinese basketball player before this can happen. We approached Good Karma Kitchen (tucked modestly in the back) and ordered the Organic Veggie Chili with Cornbread and Asian Stir-Fry. People were eyeing my Asian Stir Fry as the intoxicating aromas wafted through the park behind me. I won't bore you with a verbose account of my meal, but it is definitely worth visiting multiple times. I could not get enough of the flavorful and aromatic stir fry, and my sister-in-law's Veggie Chili and cornbread hit the spot. Good Karma Kitchen has so many vegetarian, vegan, and gluten-free dishes to offer, I just wish I lived closer to taste some of their high-demand specialties such as their "Vegetarian Chicken Fried Steak". They had a constant flow of traffic and most visitors looked more than pleased with their GKK selections. Don't you just wanna hug 'em?...and then ask for one of those cookies? When did you know you wanted to have a food truck? We have been planning a family owned vegetarian concept for a little over 3 years. We were about to launch a vegetarian line of products and personal chef services when Megan was diagnosed with celiac disease. 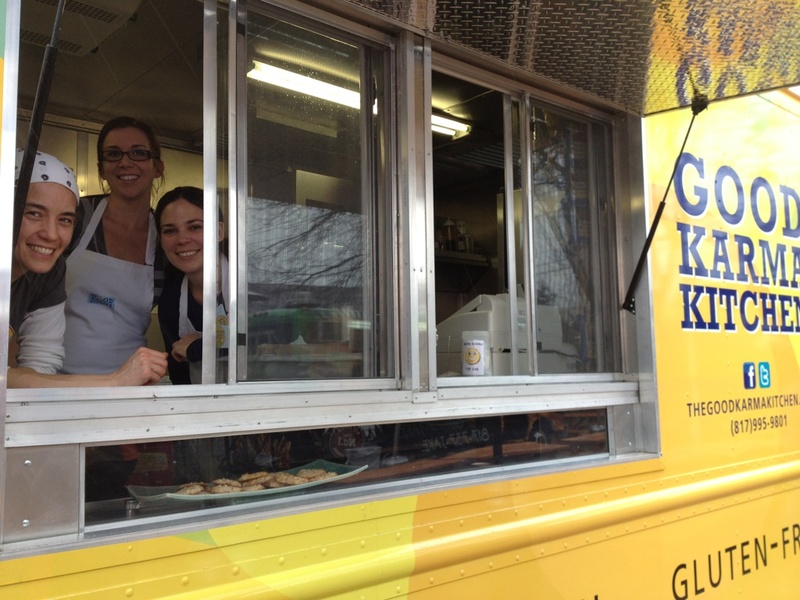 The difficulties of finding quality gluten-free foods is really what propelled us into the food truck arena. We wanted to be able to provide high quality gluten-free vegetarian food to communities that have few, if any, safe dining choices. We spent the better part of a year planning the concept, designing the recipes, building the truck and working on a solid business plan. Do you think it’s challenging to serve vegetarian food in Texas? It's the combination of gluten-free and vegetarian that is extremely difficult. In terms of our business, we've been very fortunate to be located inside the Fort Worth Food Park. It has made it easy for customers, who might not have otherwise tried our food, to take a chance on us. We think it would certainly be easier to serve meat and certainly easier to make money as a food truck. However, for us, it is not something we will ever consider. Both the vegan and vegetarian communities have been incredibly supportive and the community of Fort Worth, as a whole, seems to appreciate our concept and what we are trying to accomplish. Our favorite times on the truck are when people are surprised by our food and come back time and time again despite their initial hesitation at trying something vegetarian. What are some things carnivores have said about GKK food? One of the funniest comments was a gentleman who didn't realize we were vegetarian and called us Good Karma Chicken. We didn't say a word and he came back later and got the Spicy Asian Flatbread and said the chicken was really tasty. I think more than anything people who usually eat meat comment on our chili. It's very hard to tell it isn't meat and we get asked all the time what type of beef we use or if they can have the recipe. So far we haven't had a negative comment about serving only vegetarian food. What is the most surprising thing about running GKK so far? The overwhelming support from the vegan community is the greatest surprise. We hadn't anticipated that so many people would be interested in gluten-free vegan options. It has really changed the way that we prepare our food and what we offer on the truck. Originally, we had only one or two vegan items. Now nearly all of our menu comes with a vegan option and our pastry chef is overwhelmed trying to keep up with the demand of vegan desserts. We can't say enough how much we appreciate Spiral Diner and all of the vegan community for their love and support. What is the hardest thing about your job that we don’t see? That one is easy. It's the prep work that goes into each and every service. We are a 3 person family business and, because we are completely gluten-free, most of our products are made by hand. To give you an example, the Spicy Asian Flatbread requires us to make our own gojujang which in and of itself is a 45 minute process. It's one ingredient that goes into one sauce and there are three sauces that top the flatbreads. The flatbreads themselves we make by hand and for a weekend service it takes anywhere from 5-7 hours to make enough. With Megan holding two teaching positions and working as the Director of Operations at the UTA Fort Worth Center, it isn't hard to imagine how little time we have to get prepared. It will get easier as we expand but for right now there are many nights where it's all hands on deck for marathon prepping. Having said that...it's funny what people are capable of. We can get 5 hours sleep in a weekend and get on that truck and feel like we're on top of the world when a customer likes our food. Every positive comment is worth it's weight in gold with us. Everyday we get a positive comment is pretty rewarding. It's not like anything else in the world. When you put every ounce of yourself into something and each and everyday someone thanks you for it...well it doesn't get much better than that. I think the most rewarding moment for us was when a mom brought her son to the truck. He was probably 5 or 6 and had never had chocolate cake before due to celiac disease. He was so excited and grateful that he actually cried and made all of us choke up. To see his face as he bit into our chocolate dream is something none of us will ever forget. What is your opinion on Fake Meat (Morningstar, Quorn, etc)? We have mixed emotions on this one. On the one hand we love making our meatballs and country-fried steak and on the other we know that our intake should be limited. Currently, all the "fake meat" products on the market contain gluten so we obviously don't consume or carry them. Our own "fake meat" is made using soy protein and we use wholesome ingredients to make them. No artificial anything and so we definitely feel better about serving it. However, we're working hard to balance our menu with soy free options and options that don't call for "fake meat" and that are naturally vegetarian. If my last meal was with Good Karma Kitchen, what should I ask for? Can you get a combo? Megan says the Spicy Asian Flatbread while Christina says Good Karma Organic Chili. Aubree says the Chocolate Dream for sure! Where do you like to go out to eat in DFW? We are lucky to have found two great places that we can trust and that provide extremely delicious gluten-free vegetarian meals: The Munch Box Food Truck and Spiral Diner. The Munch Box guys are permanent with us at the Food Truck Park and make us at least 5 meals a week. Although they don't usually have vegetarian options they make some incredible meals on the fly! One of the owners wives has celiac disease and he is extremely knowledgeable about cross contamination. Not to mention their food is just awesome! Are your plates, cups, and bowls biodegradable? Yes! More than that - every service item is made from recycled material, is recyclable and most are compostable. Even our forks and spoons are made with potato starch! Great interview! I so wish there was one around here! Thank you Jenny! Sorry for my very late reply. I do appreciate your comment! I've been wanting to try their food for so long now and this post really has me craving their chili! Great post! Very cool interview! The Karma Kitchen's food is amazing! I love the nachos. The spicy asian flatbread is something I crave! love these ladies! It is delish!! I finally got to try it!! Darn it, I wanted you to entice me with a verbose account of your meal. I look forward to the post-RFR drool. Heehee! Too funny!! MG - you gotta take Bella there and then head to the FW zoo. make a day of it! Next time I am in Dallas, I'll make a stop there. Great interview! Yes! Please mark it down! Thanks for your comment! We have been eating 4-5 vegetarian meals a week anyway and if you know what you are doing with food, no one misses the meat. Sorry just now reading this. Am behind and clearly missing out! I think it's time you quit your day job for reviewer. Next time I visit Big D, I hope we can have some veggie adventure together! Absolutely! That would be so fun!